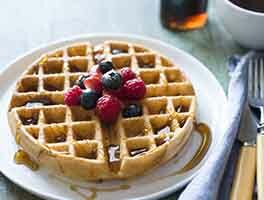 This recipe is for a very typical plain waffle, crisp and golden, perfect with maple syrup and butter or berries and whipped cream. When made with pastry flour it will be extra crispy, and light as air inside. 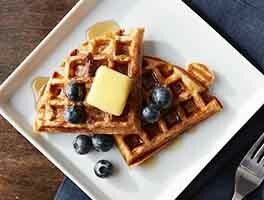 When made with all-purpose flour the waffle has a bit more body — still light, but chewier on the inside. 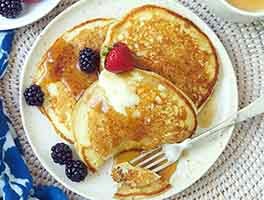 The optional pecan meal or almond flour add a nice nutty flavor. Waffles are best consumed as soon as they're baked, but in a pinch you may place them on a rack to cool, wrap tightly to store in the refrigerator, then reheat for 6 minutes in a 350°F oven. Delicious! Light and crispy! 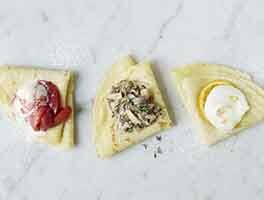 This might just be my forever waffle recipe. Great recipe especially with the almond flour mixed in. I've also made this with gluten free batter with good results as well. Note that if are using a Belgian waffle maker, you will use a larger amount of batter. I use about a cup of batter with my larger waffle maker and I bake for a longer time (6-8 minutes each). Again, make sure that you are following the waffle iron/maker instructions and paying attention when cooking. This recipe is the one I've been looking for all these years: crispy on the outside and chewy on the inside and so flavorful! I subbed buttermilk for Greek yogurt because it's what I had. I used all-purpose flour and didn't bother with the pecan meal or almond flour. I love that you don't have to separate egg whites and whip them. So easy without compromising quality and so good! Amazing! The only recipe I will go to for Buttermilk waffles. If I'm not using their buttermilk waffle recipe then I'm using the Belgian waffles, both are fantastic! Really good and not hard to make. Takes a few minutes to assemble but they turn out light, tender and crispy. I used AP flour and almond flour and didn't substitute any ingredients, including the buttermilk. This is the best! Had leftover wings from Super Bowl so we decided chicken and waffles. I will use this recipe from now on. I used buttermilk powder and did add the almond flour. I have made this recipe twice now and it's great. Waffles are light and crispy. We recently discovered my daughter has a gluten sensativity so I used the gluten free King Arthur flour and they come out perfectly with this substitution. 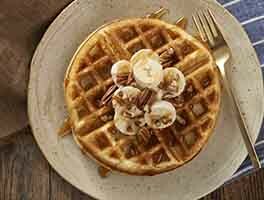 I use to think my waffle maker was bad because it never browned the waffles I made with OTHER recipes, then I tried this recipe and the waffles are PERFECTLY BROWNED and taste amazing! Thanks as always!! !